Summary: Highly recommended for all those who use a search function often - like me. Essential for those who reference posts from their own blog and/or use their own blog to file details about a book or product for when they need it for future reference - like me! I'm finding I'm using it all the time. Unnecessary if you never ever search your own blog or those of other people. You might as well use your normal search engine for the rest. These are the options it provides for this blog. I've used some but not all but can change my options at any time. At present I've focused it mainly on my own archives and posts but I'm still experimenting with which seem the best options. I recommend you do the same as the best option will be very personnel and vary from person to person. Opinion Poll: Which is your favourite make of artist grade coloured pencil? This is an update on one of the polls on Coloured Pencils - Resources for Artists - my coloured pencils information site - as at November 2009. Click the image to see a larger version of the results or visit the information site. POLL: Which is your favourite make of artist grade coloured pencil? 718 responses in total have been received to date. That's a very big increase since July 2008 when I first reviewed this poll when only 177 responses have been received. Back in April of this year it had attracted some 509 responses. So far as I am aware that makes this the largest online poll about brands of coloured pencils that has ever been conducted. The poll indicates that the market for coloured pencils is an oligopoly. Some might call it a duopoly. Two firms, two brands and two pencils alone account for very nearly 60% of the market - in terms of brand preference. Faber Castell Polychromos and Sanford Prismacolor continue to fight it out for top spot of most popular brand of coloured pencil with each having just under 30% of the responses. I review the poll on a regular basis and the positions do change on a regular basis and they are almost always with 1% of one another. Caran d'Ache Pablo share 3rd place with Derwent Coloursoft with just over 10%. 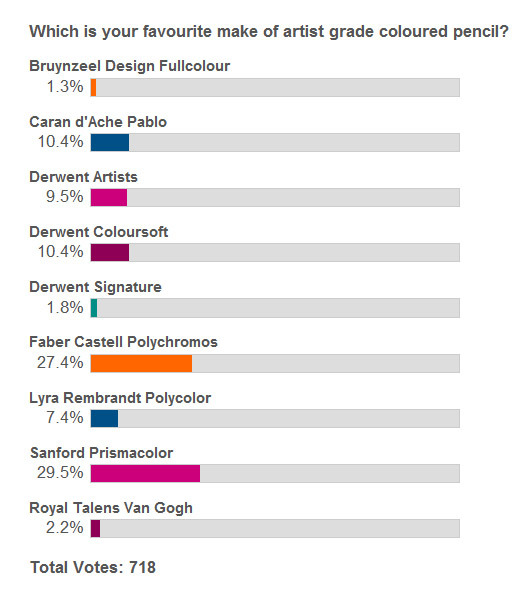 What's missing is artists who prefer the new Luminance pencil - which ill be addressed by the new poll in 2010 - see below. 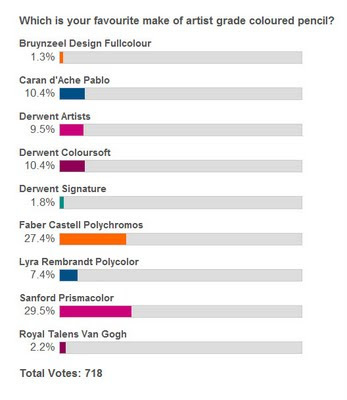 Lyra Rembrandt Polycolor have dropped back in terms of popularity to 6th place and just over 7% of responses. I suspect this may well be to do with distribution as the pencils work well with Polychromos and most shades do pretty well on the lightfastness tests. It's a brand which certainly will always find a home in my pencil tub. Talens Van Gogh pencils continue to attracted few votes despite being predominatly lightfast and an excellent pencil to use. Again I think the issue relates to availability. I've included links to past reviews at the end of this post. This is to announce that a new poll about artists' coloured pencils will be launched in January 2010. Back in April I speculated about doing an Annual Poll and that's what I've decided to do. That way both you and I can track how preferences change over time. people will have experimented with more brands and new brands and may well have changed their preferences! Hopefully by providing feedback to the manufacturers about preferences there will be some incentive to continue with a good selection in the marketplace and products which improve over time. If any of the marketing people from the different pencil manufacturers are reading this and want to make sure that any new brands in the pipeline are included please contact me with the date your product is due to be in the marketplace. Making A Mark - How lightfast are your artist grade coloured pencils? [UPDATED] This book review has now moved. 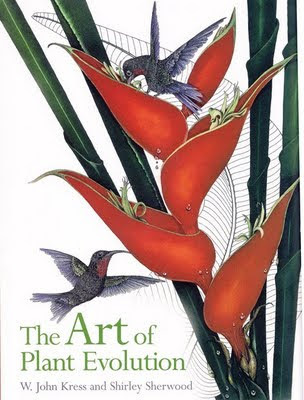 The synopsis and summary from the original post are below - the rest can be found on Book Review - The Art of Plant Evolution on my website dedicated to Botanical Art and Artists. Synopsis: This publication is based on an 'art meets science' exhibition in the Shirley Sherwood Gallery of Botanical Art at the Royal Botanic Gardens, Kew in 2009/10 to celebrate Kew’s 250th anniversary and Darwin’s bicentenary. The exhibition (and the book) provides an overview of plant relationships based on contemporary scientific discoveries and DNA test. Both contain 136 botanical paintings from the Shirley Sherwood Collection, by 84 artists, cover 44 orders of plants in 118 families, and a total of 134 species, providing a sweeping overview of the evolution of plants on earth. The paintings display a sampling of the plant world from fungi to daisies, including algae, mosses, ferns, conifers and flowering plants arranged in the most up to date evolutionary sequence, determined by recent DNA analysis. The text accompany each image of paintings in the exhibition comments on the artist's background, and the artist’s observations in the context of modern plant classification. Summary review: HIGHLY RECOMMENDED This book emphasises the scientific aspects of botanical art and provides all botanical art lovers with a comprehensive education in the botany of plant groups and families alongside numerous excellent examples of botanical art. A copy of the original post has been archived and is on file. Synopsis: This is a group biography; it provides a narrative of the story behind the famous paintings. It's a book which covers the lives of the Impressionists - Monet, Manet, Pisarro, Cézanne, Renoir, Degas, Sisley, Berthe Morisot and Mary Cassatt before, during and after the creation of their group. It charts the development of Impressionism within the context of contemporaneous development in Paris and the Parisian art world. The focus is very much on the birth of Impressionism and finishes in 1883 with the death of Manet. Summary review: RECOMMENDED This is a very dense book covering a large number of artists and has lots going on. It's scholarly and knowledgeable but a light read at the same time. I found it took a little getting into until I was clear about all the relationships between the different artists. Charting the overall relationships is also what marks this book out as being different from other biographies of the individual artists. However the author writes well, I enjoyed reading the book, didn't want to finish and would happily read it again. Knowing more about the circumstances in which artists produced their paintings helped me look at both artists and paintings in a new light. I would have liked to have been able to read more about how the artists developed during the rest of their artistic careers after 1883. Maybe that's another book? Teachers of art history - to find out how to make art history come alive! Who should not buy this? Technical data: Technical data: Publication Date 2006 (hardback); 2007 (paperback): Hardover - 368 pages Paperback 352 pages; ISBN-10 0099458349: ISBN-13 978-0099458340: I read the paper back version. Covers vary depending on editions. 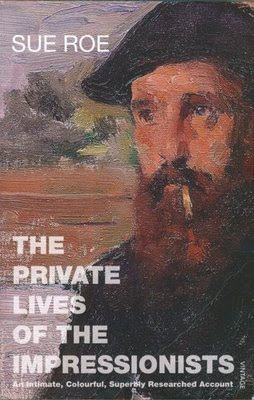 it also highlights the other people who are important to the story of the Impressionists - such as painters Caillebotte and Bazille, the art dealer Durand Ruel (who established the market for Impressionism in the United States as well as in Europe) and the paint merchant Tanguey also get pretty good coverage. it describes the environment of the places where they lived, frequented and painted as they were at the time which has provided for me a whole new perspective of certain of the works. This is also a story of the Paris which had been transformed by Baron Haussman and of the impact of the Franco-Prussian war - which had a major impact on more than one of the painters - the siege of Paris in 1870-71, the establishment of the Paris Commune and the emergence of the Third Republic. you gain insight into their familial and fraternal relationships - and the very many difficulties associated with the class system of the time without having to read a detailed biography of individual painters. This highlights some of the oddities such as the fact that both Manet and Cezanne had wives and children who were not known to their families. For Americans, there is an interesting chapter towards the end of the book which tells the story of how Durand Ruel opened up the market for Impressionist paintings in New York. This book covers a critical period for a number of the different painters who became known as the Impressionists. It's incredibly dense and covers a huge amount of detailed information in a way which speaks of comprehensive and meticulous research. What makes this book different for me is the articulation of the various relationships between the different painters. So often books about the Impressionists tend to list them as individuals and comment on their works in the same way. This book focuses much more on the connections and the way they supported and influenced once another. It's an invaluable insight also into how a group with common motivations can support one another through different challenges and emotional and financial difficulties - and there were quite a few of those! It also gives a very good insight into just how long it took some of these painters to become successful and just how financially stretched they were at times. I am particularly enjoying the way in which Roe provides an insight into the incredibly different characters and personalities of the painters. I am repeatedly left wondering quite how some of them came to be members of the same group. I like the way the book discusses how specific paintings came into being. The index is good because you can look up a specific painting by title and check out what it says - so it's good if you also want to use it as a reference source. Unusually for a paperback, this book also provides two sections of colour plates of paintings which feature in the text. It's also a really great index for tracking down particular events. In fact the notes and index - which make up around 20-25% of the pages of my paperback persuade me that this is a very well read, well researched and well organised author! It's brilliant for providing you with references to sources if you want to pursue some particular aspect of one of the painters. while studying late 19th century European History at school! Now I know I've succeeded in making it seem incredibly academic - but the reality is that this book is an incredibly easy read. Roe has a gift as storyteller. She has been able to take dry facts and convert them into a narrative which is always interesting - even when it takes you down paths you're not quite expecting. I also think this book would be a terrific read for anybody currently facing challenges associated with the credit crunch and the recession. Reading about people facing very similar difficulties somehow helped to remind me of the enduring themes and challenges of life. There really is nothing new under the sun - except when somebody has a bright idea about how to apply paint! Note (2) about the author: Sue Roe is a freelance writer and teacher. A former Lecturer at the University of East Anglia, she is the author of a novel, Estella, Her Expectation, a collection of poems, The Spitfire Factory, and Writing and Gender: Virginia Woolf’s Writing Practice. She is also co-editor of the Cambridge Companion to Virginia Woolf, and her most recent book is the widely praised Gwen John: A Life. She lives in Brighton. I've just put my main blog and this blog on NetworkedBlogs on Facebook. I'm thinking of doing a review of this application at some future stage - from the perspective of artist bloggers on Facebook - and wondered if anybody would like to help out by offering your views (see questions below). 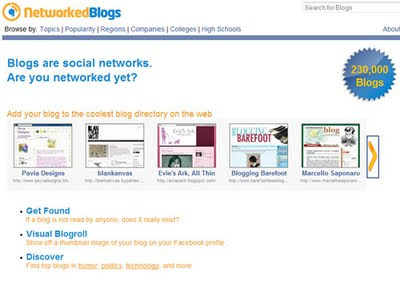 NetworkedBlogs is a facebook application. Think of it as a social network for bloggers inside facebook. Add a visual blogroll on your profile, and show of your blogs and blogs you like. NetworkedBlogs also aggregates the RSS/ATOM feeds from thousands of blogs and allows you to read the latest news selected by users like you. Please only comment if you are an artist blogger on Facebook. Any spam will not be published. I'd like to hear about your reviews of this facebook application. You can use my basic queries listed below if that helps you. Please respond to as many or as few as you want to. How did you find the installation of networked blogs? What did you think of the verification process? If it has brought you no benefits do you know why that might be? What do you think of the blog directory generally? What do you think about the Directory listing being limited to 50? Do you like networked blogs? What's your overall impression of NetworkedBlogs after using it? Would you recommend it to other Facebook users? Would you recommend it to other artists on Facebook? Anything else? Do also feel free to comment on any other aspect not covered above. Summary: A bookshop to go to if you have a special interest in botanical art, botanical artists and/or drawing and painting gardens, flowers, plants or trees. It's useful and good but could be even better. Shop hours: Kew Gardens opening times - Kew opens at 9.30am every day except 24/25 December. Closing times vary by season. catalogues from the latest and past exhibitions at the Shirley Sherwood Gallery of Botanical Art which is the first gallery in the world dedicated solely to botanical art and which is open all year round. this is a shop which focuses on gardens rather than art so few general art books. One of the highspots of my regular trips to Kew is ending up in the shop, next to the Victoria Gate, just before I leave to see what's new on the botanical art shelves. Or to see sometimes what's now on display which hasn't been around for a while. 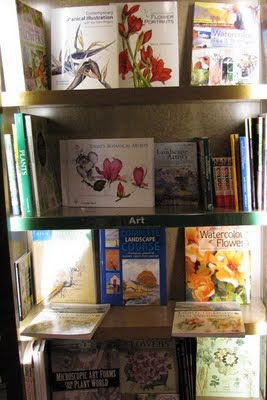 My visits suggest there is usually one complete set of shelves devoted to botanical art books - about the art and the artists - including most of the good books about contemporary botanical art published in recent times. This now includes the catalogues from the two or three exhibitions each year at the Shirley Sherwood Gallery. It also includes Dover publications of etchings and fine art prints of botanical art from the past - which I find quite fascinating. Books range from the very expensive through to the very reasonable. I've ummed and ahhed over quite a few in my time but very varely leave without at least one new book! I'm one of those people who needs to see some books in my hands before I buy them. When that's the case I invaribaly always buy them from the shop that's taken the trouble to stock them rather than online - on the basis that if we don't do that we soon won't be able to see them before we buy! Another set of shelves is devoted to art instruction books with many of the popular books about botanical art. It also includes more general books about painting landscapes and trees. 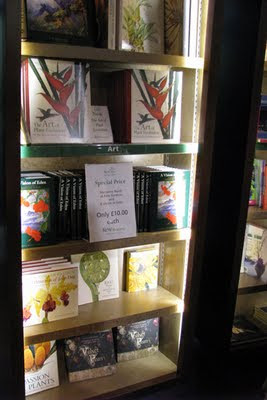 It is however a botanical art bookshop which could be even better. I could improve the selection they keep in regular stock if they'd let me make suggestions! 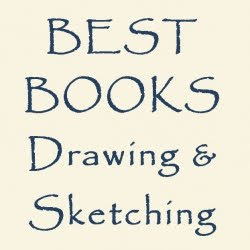 For example there are some really excellent botanical art instruction books which are not on display (see my Book Review: Botanical Illustration by Valerie Oxley). I also couldn't see the Society of Botanical Artists books this time around which is unusual. Stock levels also looked rather lower than usual.